Esportsbetting.com is a site that is fully dedicated to betting on Esports events. A relatively new betting site, it was launched in 2016 and is located in Malta. As such, the casino operates under a license from the Malta Gaming Authority, which ensures that it complies with a strict set of rules and regulations that generally benefit the players. The great thing about this site is that unlike other Esports sites, the focus is fully on Esports, so these are on full display and not hidden away. Instead, it is the slots that are harder to locate. The site itself is clear and easy to navigate with not too much clutter but instead; excellent menu options that carefully direct the player through the site. 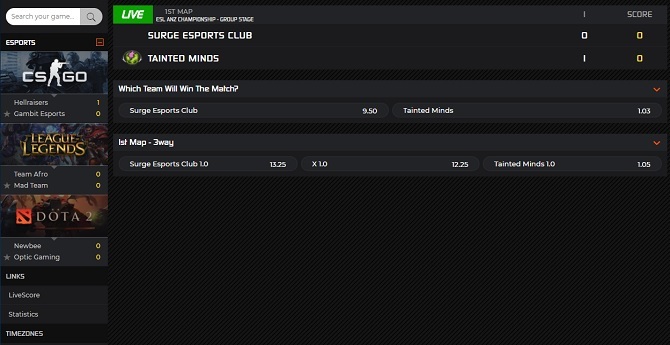 Even though the site is new, they already have a large selection of Esports to place bets on. To round off, the welcome page also has recent news and blog items on Esports events, allowing players to keep up-to-date with all the current teams, events and action. Esportsbetting.com offers an excellent welcome bonus to new players signing up to this betting site. This simple bonus offers players a 2 x 13.37 euro bet on the site. 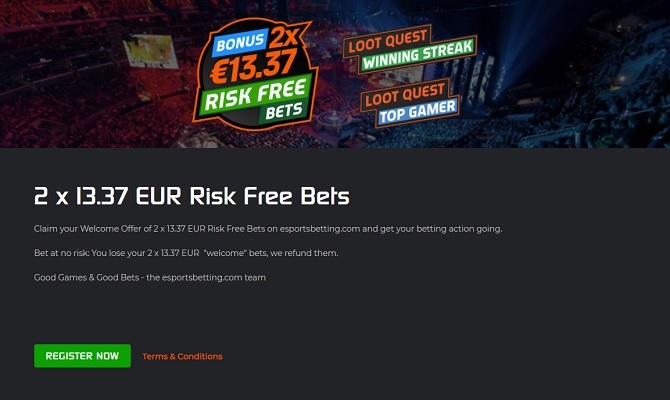 This is a completely no risk bet because if players lose their bet, Esportsbetting.com will simply refund them! This bonus will be added to the player’s account for a period of 30 days after registration. Failure to use the bet within that time will result in the bonus expiring. In order to use this risk free bet however, players must have an account balance that is the same or larger than the value of the bonus bet. Any winnings that are made from the bonus bet are then termed as bonus money and subjected to a 1x-wagering requirement, which must be fulfilled within seven days at odds of 1.70 or greater. Success in this area will turn the bonus money into real money and then can be withdrawn from the account. This Esports betting site offers a great range of Esports matches to choose from. There are all the main favourites here including CSGO, League of Legends, DOTA 2, Overwatch and PUBG. There are even a couple of less common games such as StarCraft and Call of Duty available as well. Players can place their bets in advance or watch as the game unfolds through the live Esports section. All games are well covered, with a number of them having live coverage and even countdowns to when the next match is about to take place. There is an Odds Highlights section that allows players to easily see upcoming games and where the different teams stand on the board. This is all neatly separated out by the individual games. The site does offer other casino games as well, though these are the ones hidden away. Under the tab ‘Games’ is where players can find them. There is a good range of slot games available, including classics such as Starburst, Bloodsuckers and Jack Hammer. There is also a good range of table game options available and, surprisingly, a well-stocked live casino. 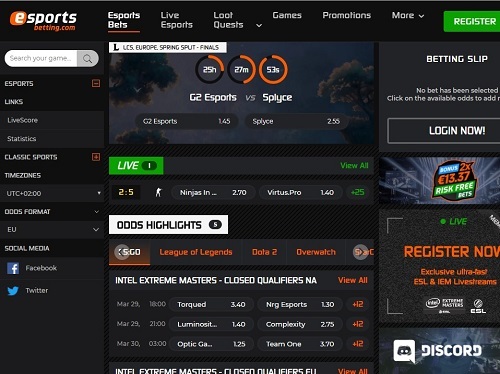 The live section of this Esports betting site displays all the Esports odds in real-time; the site is constantly updating to make sure that players do not miss any action. There is a list of bets that are available for that current game or tournament and include such things as which map, first kill and more. Players have multiple options and settings that they can utilise in order to maximise the effectiveness of their live bets. Time zones can be changed in order to ensure players don’t miss a game, odds format can be toggled between EU, UK and US so that players can completely understand the system. There are links to live scores and also team and tournament statistics so that players can make a fully informed decision before placing their bets. It should be noted here that Esportsbetting.com makes every effort to ensure competitive odds on all of its games. To further compound the true excellence of this site, players are able to make in-play bets and, thanks to a great set up on the part of the site, players can watch many of the games through a live stream. The site is completely compatible across all devices. The mobile site is as equally intuitive and navigable as the desktop version. Players can make and access the same betting choices all at the click of a button. The set-up is designed to accommodate both new players and those with plenty of experience, though the mobile version has to be accessed via the website or through the excellent app developed for the site. Players have a number of choices when it comes to the method they wish to use to place a bet. 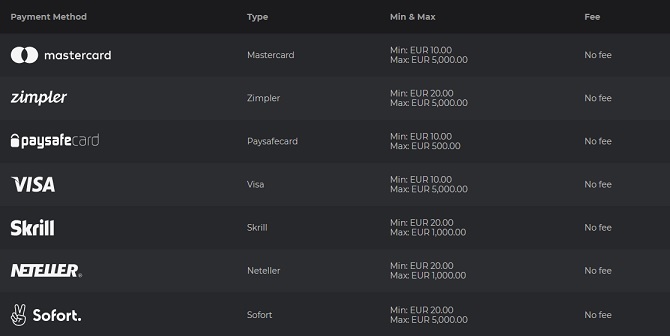 They use only trusted vendors for these transactions and these include Visa and MasterCard, Skrill, Neteller and even Paysafecard. Not all options are available in every country, so checking out in the footer of the site which method is available is a prudent move prior to signing up. Limits for all options range from 10 or 20 euros through to 1000 or 5000 euros at the other end. Happily, there are no fees associated with any of the payment methods. The site is the brainchild of a group of gaming enthusiasts. Between them, they have more than 25 years of industry experience, which they used to create the site and bring it to life. The aim was to create an easy to use, yet entertaining page that delivered all the important aspects and features pertaining to the gaming world, directly to the players themselves. As the creators themselves were and still are players, they understand what it is that the players need. Part of this encompasses their desire to offer a transparent service complete with security features throughout the site. This includes the importance of constant customer support, secure transaction methods, and an easy registration setup. And these are only the jumping off points. Support is always important on any Esports betting site, and with this in mind, Esportsbetting.com takes great pains to ensure an excellent service. The main option here is the 24/7 live chat function. This provides an almost instant response to any queries a player might have. The agents on the other end are always helpful, offering great advice for all manner of problems. There is an email available as well, though this can take a few days to elicit a response. There is also a phone number if players prefer a direct chat, though this is the most expensive option of the three. Security on the site is also taken very seriously. The site is licensed with MGA, which means that they have to follow very specific laws if they are to remain in business. It is also protected by an SSL encryption running through the entire site, which means that third parties cannot gain access to any personal data. Esportsbetting.com is a gamer enthusiasts dream. This is the perfect set-up that many Esports bettors have been waiting for. No more are there limited numbers of games or betting options. Instead, the site offers everything a player could want, and more. Many previous Esports sites offered few features and rather dubious security, but this has all changed with Esportsbetting.com. In fact, the high level of security offered by the casino and the fact that it operates under Maltese gaming law is one of the major selling points of this betting site. The website and mobile app are both equally functional and offer a clear set-up of all bets available, games on offer, live events and streaming abilities. The addition of a number of news and blog features is excellent, as it allows players both new and old to keep abreast of the goings on of their favourite team, game and event. In addition, the site goes one step further and has a number of social media accounts offering even further information about the latest games and features. The fact that it offers a small casino is just an added bonus, though for once, this is the hidden feature rather than the Esports being side-lined. With a great welcome bonus, and secure, risk free betting options, this Esports site is the one to go to. What are you waiting for? Head on over, sign up and grab your welcome, risk free, bet right now.